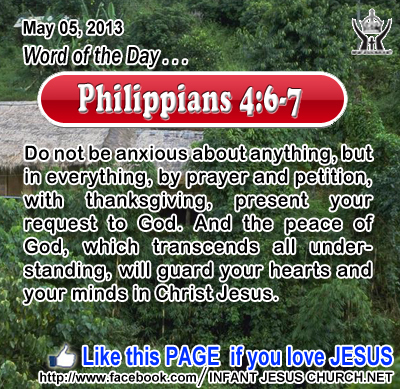 Philippians 4:6-7: Do not be anxious about anything, but in everything, by prayer and petition, with thanksgiving, present your request to God. And the peace of God, which transcends all understanding, will guard your hearts and your minds in Christ Jesus. Loving God, we have so many reasons to praise you. In the face of trial and hardship we have your promises to revive our hope. In the moment of victory we have you to thank for our abilities. In the boredom of the routine, we have great joys in your surprises. Thank you for being so great and yet so loving. In Infant Jesus' name. Amen. 23Jesus answered him, "If a man loves me, he will keep my word, and my Father will love him, and we will come to him and make our home with him. 24 He who does not love me does not keep my words; and the word which you hear is not mine but the Father's who sent me. 25 "These things I have spoken to you, while I am still with you. 26 But the Counselor, the Holy Spirit, whom the Father will send in my name, he will teach you all things, and bring to your remembrance all that I have said to you. 27 Peace I leave with you; my peace I give to you; not as the world gives do I give to you. Let not your hearts be troubled, neither let them be afraid. 28 You heard me say to you, `I go away, and I will come to you.' If you loved me, you would have rejoiced, because I go to the Father; for the Father is greater than I. 29 And now I have told you before it takes place, so that when it does take place, you may believe. The world's approach to peace is escaping of trouble and a refusal to face unpleasant things. Jesus offers the peace which overcomes our fears and anxieties. Nothing can take us from the peace and joy of Jesus. No sorrow or grief, no hazard, no suffering can make it less. Jesus speaks of his target and ultimate triumph over the powers of evil in the world. In the eyes of the world the cross stood for shame, embarrassment, and defeat. Jesus went to the cross knowing that it would lead to triumph over the powers of sin and of Satan. Jesus also knew that he would return to his Father in glory. The cross gets glory to Jesus and to the Father and it is our way to glory as well. In the Cross of Jesus we find true peace and reconciliation with God. Loving Infant Jesus, in love you created us and you drew us to you. May we never lose sight of you nor forget your steadfast love and faithfulness. And may we daily dwell upon your word and give you praise in the sanctuary of our heart.